THE SCENE: Chilly but it didn’t take long to warm up. It only 3. Start at the top of the serpentine path and runs down. 3 reps at every light pole and lung after the last pole to the end. Pickets Charge – Run to the top and touch the Asylum. THE SCENE: It was a Balmy 16 Degrees. Bring snacks for Wesley House! Can go back down escalator: 40, 30, 20, 10, run, 30, 20, 10, run, 20, 10, run, 10. SheHateMe –5 Sets Run50 yards between sets. 2 Timothy 1:7 – God has not given us a spirit of fear, but of power and of love and of sound mind. This islLinked to the concept that we are wired for love and natural optimism. We cannot control events or circumstances, but you can control your actions. When we operate in our normal love design in God’s image we are able to change the shape of our DNA forever. May 30, 2018 Proton Comments Off on Bearway to Heaven? THE SCENE: Lots of gloom to be had. 3 times up the will with increasing 2 burpees each time. 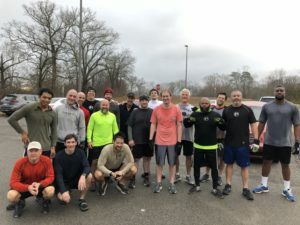 One of the things I love about F3 is that when we come out here we are not here to compete with one another. We are not here to prove ourselves but to encourage one another. It is not about what others think and not even about what I think but what the lord thinks. Re-live the gospel ever day. Christ’s perfect performance on the cross is the one that matters. He died on the cross so that we don’t have to meet some standard set by others or even ourselves.